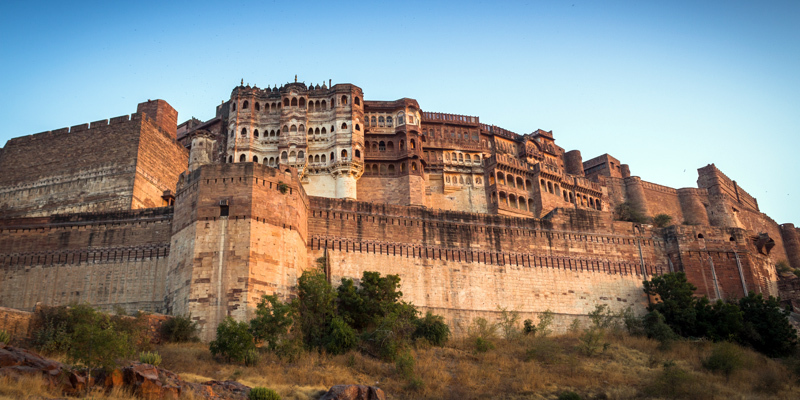 The majestic Mehrangarh Fort is one of India's largest forts and located in the picturesque city of Jodhpur. The work of building the fort originally commenced in 1459 on the behest of the founder of Jodhpur - Rao Jodha but much of the fort as it stands today was built in the era of Jaswant Singh. This magnificent fort is spread over 5 kms. and is located on top of a hill which is all of 125 meters high. To honor and memorialize momentous triumphs there are three stately gates to the fort. Once inside the fort visitors can't help marveling at some astonishing palaces which are a living testimony to the high standard of craftsmanship prevalent in those days. The Moti Mahal which is made of elaborately carved stones is the dwelling place of the royal throne of Jodhpur which is popularly referred to as the Sringar Chowki in local parlance. There is also the majestic Umaid Villas that showcases some remarkable Rajasthani miniature art work. The Ajit Villa is conspicuous with its rich collection of musical instruments and regal attires while the gorgeous Phool Mahal is where the legendary Jodhpur Coat of Arms is preserved. The parapets of Phool Mahal are adorned with exquisite art works portraying various melodious scenes. For some bravado, one doesn't need to go far. There is the well preserved Maan Villas which exhibits the arsenal and weaponry of the house of Rathores. The intriguing Tent Room is fabulous which has distinct Mughal features. Legend has it that it was once used by Mughal emperor Shah Jahan. The tent is richly embroidered with gold and is literally a treat to the eyes. Mehrangarh fort has never ever been seized. The invincible fortifications are six meters thick. Some of the walls still bear cannon marks and today this magnificent Jodhpur fort is a living testimony that recounts the chronicles and legends of Jodhpur's rich past.